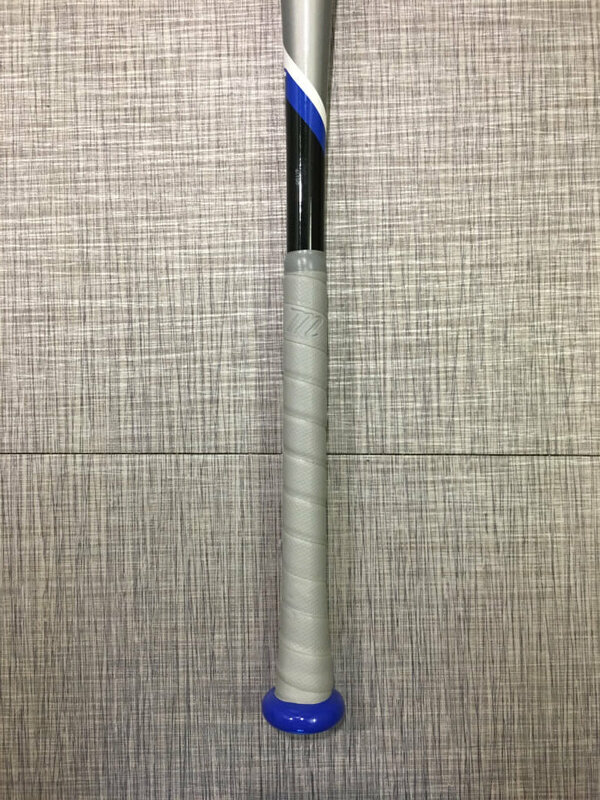 Shop this bat at JustBats.com. 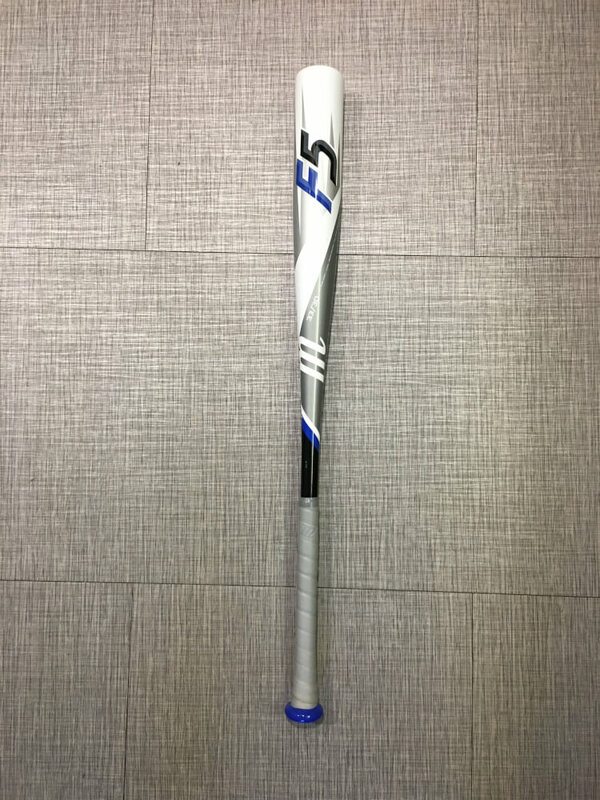 The 2018 Marucci F5 is Marucci’s budget offering. It’s a simple bat that features Marucci’s durable one-piece craftsmanship without any of the additional technology they put into their higher-end bats. 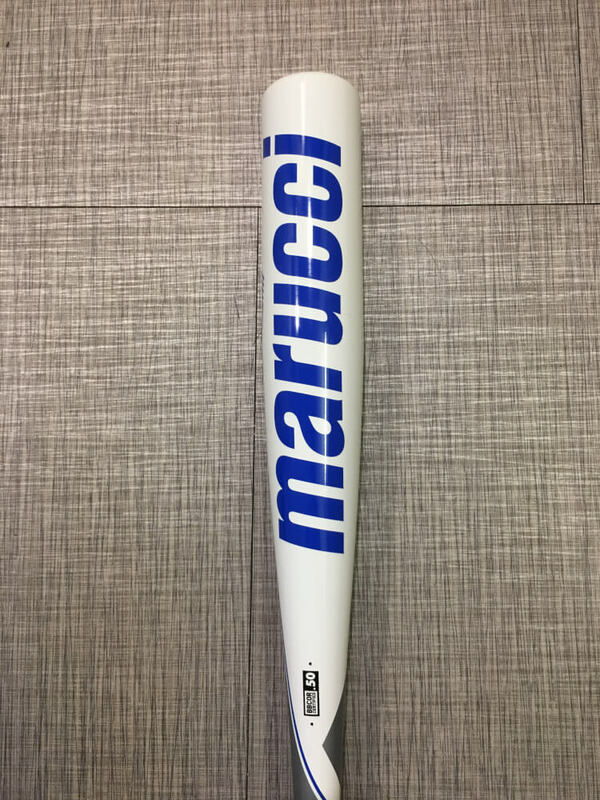 Marucci went away from its typical simple look and went with a glossy colorway that includes white, black, silver, and blue. 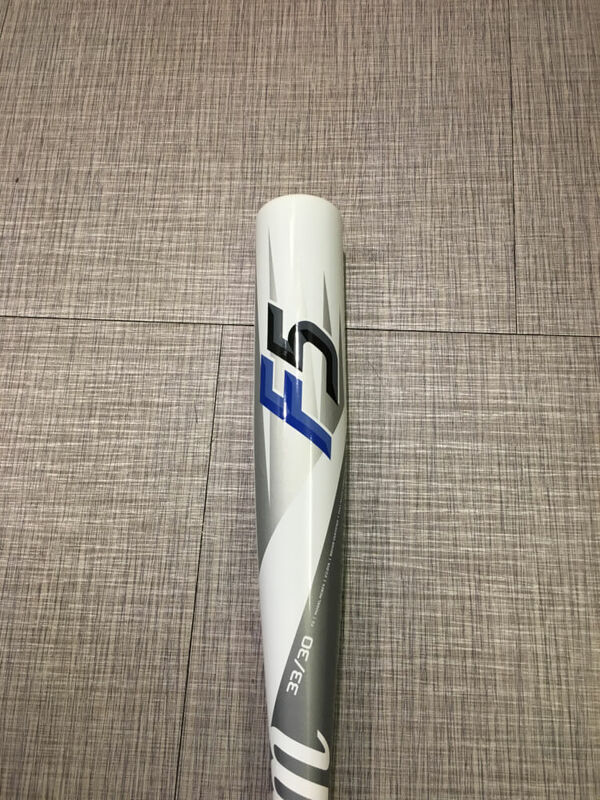 While I liked the simplicity of Marucci’s previous designs, I feel that the F5’s design does a little too much for its own good. Just my two cents, though. Do you dig it? The barrel is mostly white but is broken by a stroke of silver on one side in addition to a design that looks like the head of a pitchfork. The lettering is mostly blue. The handle is mostly silver and black with a little blue. The gray grip is paired with a blue knob. The F5 has the high-quality grip that can be found on all of Marucci’s metal bats. 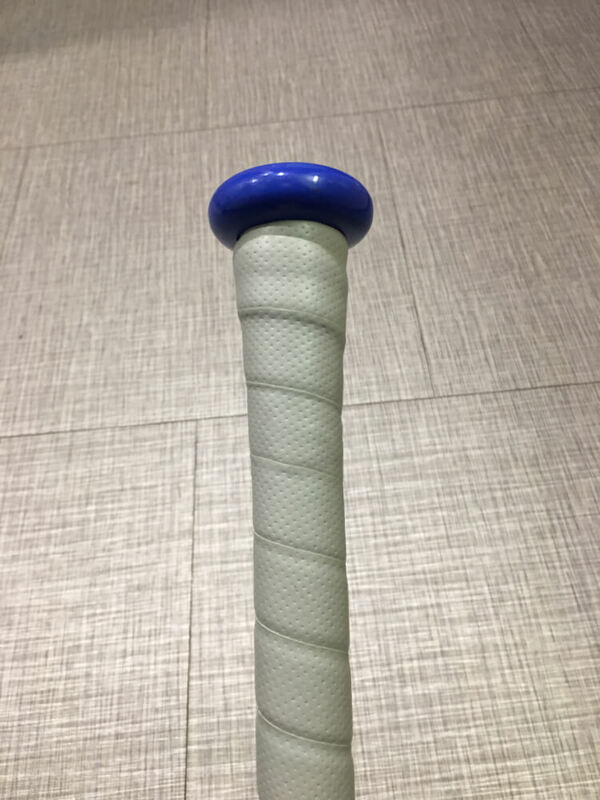 The grip is one of the softest out there and provides good friction. It has a slight taper into the knob. The knob is a traditional shape and is very wide. I found this to be very uncomfortable on swings, especially if you don’t choke up. If the knob was a little narrower, it would be fit into the bottom hand much better. There isn’t any vibration dampening technology in the knob, which I found to be problematic on contact. The barrel on the F5 is an average size for a one-piece alloy. This barrel is almost exactly the same size as the CAT 6, and is an inch shorter compared to the CAT 7/Posey 28. 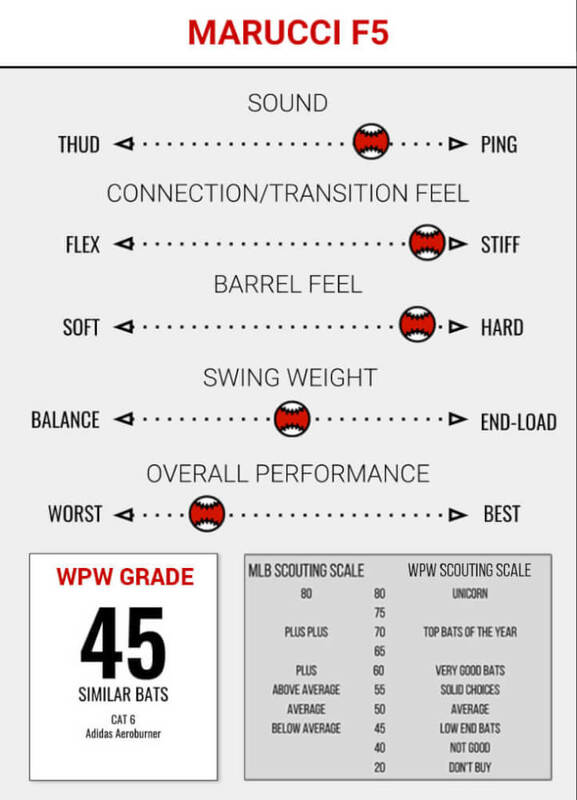 The swing weight is balanced, but you aren’t going to get the extreme lightness that you would with bats such as the pricier Velo. This is because the F5 was released as a value bat. Ultra-light swinging bats are more expensive to produce. Because it’s a one-piece alloy, the F5 was very stiff throughout the entire swing and also at contact. This one-piece construction also contributed to the vibration, which was very high on contact away from the barrel. The vibration was much higher than other Marucci one-pieces because of the lack of Marucci’s signature AV2 knob, which kills most vibration. I experienced significant vibration in my bottom hand, which isn’t very common. 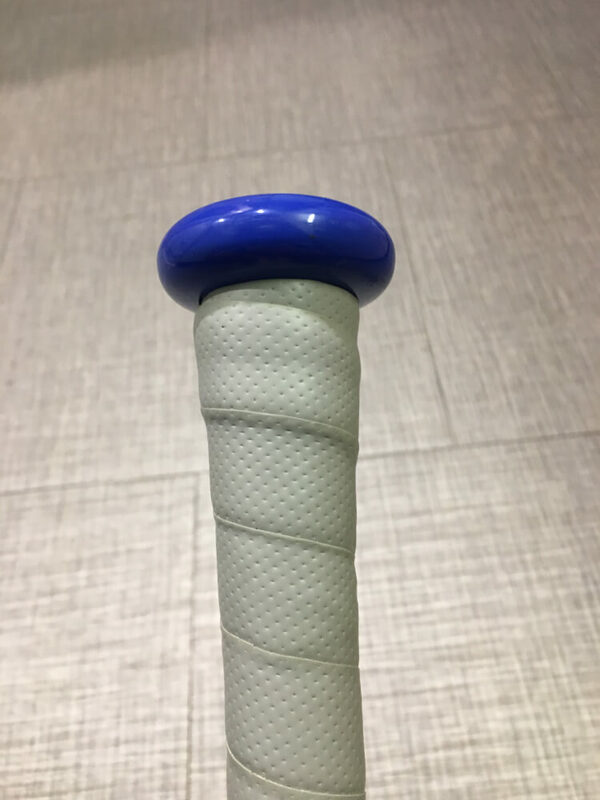 If we had to guess the cause, we think that the thicker grip may contain some of the vibration, but the large knob sends the vibration into your bottom hand. On contact, the bat produced a subdued ping that didn’t make your ears ring. The F5 feels like a lower quality bat. It doesn’t do anything exceptionally well and the vibration is very high. Unless your price range is strictly at $150, I highly recommend spending the extra $100 for Marucci’s higher-end models. Shop the Marucci F5 at JustBats.com.